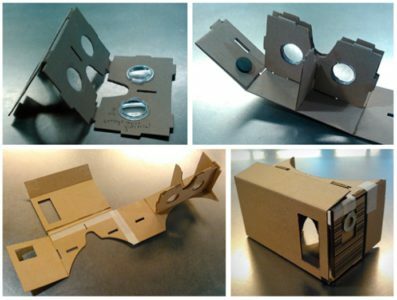 The first step in building your very own Google Cardboard Virtual Reality Headset is choosing the type of cardboard to use. 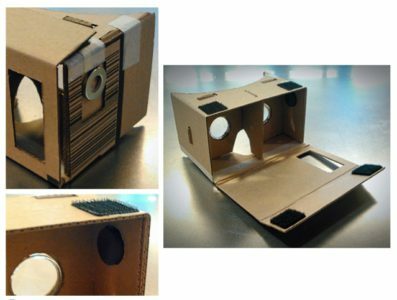 The official Google site https://www.google.com/get/cardboard/ says you should use cardboard that has a thickness similar to that of a "sturdy shoe box." Studying the official press photos showing the Cardboard viewer that Google gave away, it appeared to me that the cardboard is, indeed, thinner than the kind typically used for boxes for packaging computers, electronic gadgets or kitchen appliances, but sturdier and thicker than the rigid paperboard of the average shoebox. A used take-out box for a large-sized pizza is a perfect solution. Precision Knife, Scissors, two magnets: One is a ceramic disc kind; the other is a metal ring disc. Both are super strong magnets (especially the ring one), available at Home Depot. The ceramic disc magnets is around $2 for an 8-pack, and the ring magnet in a 3-pack for $3.98. Two adhesive Velcro fasteners, a rubber band and the lenses: Google recommends 45mm focal distance asymmetric biconvex lenses. 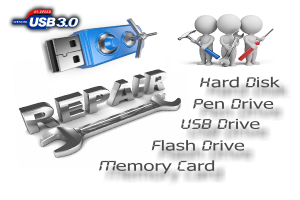 You probably won't find these for sale at a hardware store or general retailer near you. I found some at Banggood.com for 89 cents each (don't forget to buy two), but you'll have to wait 7 to 20 business days for shipping. If you want them faster, you'll likely have to pay a lot more. I found some at Amazon for $10 a pair plus $8 shipping. You'll also need access to a printer (and standard printer paper) to print out Google's Virtual Reality Headset templates. 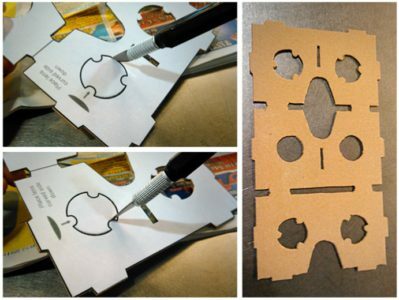 To start, print the PDF templates for the Cardboard viewer parts onto three 8.5-x-11-in. paper sheets. It's broken up into three parts on the printouts, and you have to join them together into one as I've done here. The second major template is for the Lens Holder and the third is for the Vertical Divider. 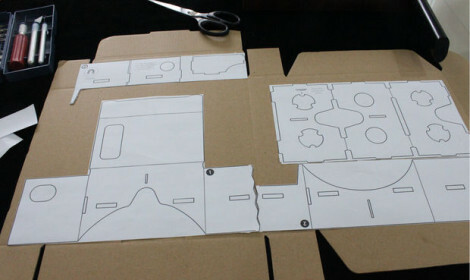 Once the templates are in place on the cardboard, it's time to cut the cardboard itself. I strongly advise cutting out the openings on the templates from the paper sheets with a precision knife on a large, stable table surface that's protected with several sheets of newspaper. Step3: Join the pieces of the viewer case. Gray lines marked on the template show where you make a fold on the corresponding cardboard part. So, using the precision knife and a ruler, lightly score these parts of the cardboard and fold out the cardboard along the scored line, and then folded it back in along the line. Use the precision knife to cut through the three outer curves first in these circular patterns (top left) and then cut the three inner curves next (bottom left). This will make removing these interior openings easier than trying to cut them out in a single clockwise or counter-clockwise path. On the right is the lens holder fully cut out from the pizza box without the template paper.